I've got a small update for you all! A little late but I hope everyone enjoyed their Winter and any festivities. As always, thank you all for your submissions and support! Podkomorka, I got another good one for ya. 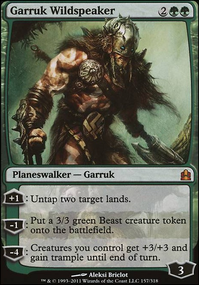 Beast tribal with Krosan Warchief as the general. Hey so overall the first impressions haven't been too good, the deck sometimes works and gets off to an explosive start but its draws are always a guess to say the least, mulling into oblivion is a problem I faced repeatedly. There is much too much variation at this juncture in the way the deck feels and plays, in other words we need to streamline this a bit. And to do that one needs decide which route the deck is going to be taken, and personally i feel a mono-green stompy or devotion list would best suit what is already here. 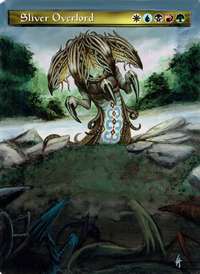 Pretty much everything, I'll save a bit of time by just saying that a lot of the one-of's and two-of's have better alternatives, the only creatures i would keep are Llanowar Elves, Kalonian Tusker, and Obstinate Baloth (and even then Obstinate is better in a sideboard); the most important cut is Krosan Warchief it just isn't modern legal unfortunately. 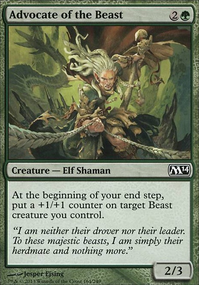 In addition to these creature cuts I would cut all the pump spells as well as Ring of Kalonia, and i know you have built this deck around it but also Primeval Bounty, I never once resolved this card in testing, I never even wanted to. So here the decision really is yours 2 of these sets should be in the deck, you want 8 accelerators in my opinion, these are the most budget friendly options; note however that if you choose to play Arbor Elf then you also want Utopia Sprawl. One or the other both may be too much. In my opinion you want both of these, they provide great curving threats whilst also fueling the devotion gameplan. These are your best threats. A resilient threat that works well with the devotion plan. The big payoff, a huge threat that hits the board and makes an immediate impact. 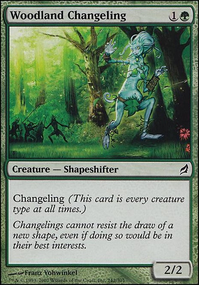 The rest of the creature slots can be devoted to silver bullets so to speak, things like Scavenging Ooze or Reclamation Sage to have some mainboard hate, Courser of Kruphix for more acceleration, Tireless Tracker as just a great card. Provides much needed flexibility in combat as you can focus on curving out whilst still being able to pump. Protection as you will go wide, this is usually a sidebaord card but can see play in the main as a one-of depending on meta. Our removal of choice, flexible and efficient, great for getting those last points of damage in. A must if you play Arbor Elf, with that combination of cards it is possible to make 4 mana on turn two. I personally believe he is good enough to see play, he is flexible enough that i can see him being quite effective. 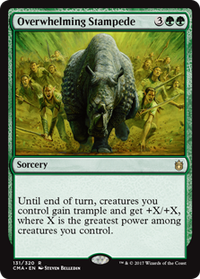 This would require lowering the curve and removing anything above 3 mana but company is an incredible tempo play in a deck like this, providing some much needed acceleration, however you sacrifice the devotion plan in favor of it, and likely play Eternal Witness to recur company. In the end the deck is yours so these are all just suggestions, i hope they help, I really see this more as a stompy list in need of a focus, hopefully the above provides some inspiration. If i have completely missed the mark however in what you are trying to do then let me know and I'll adjust. I'd also be more than happy to help with a sideboard. Krosan Warchief and Burgeoning are not modern legal. 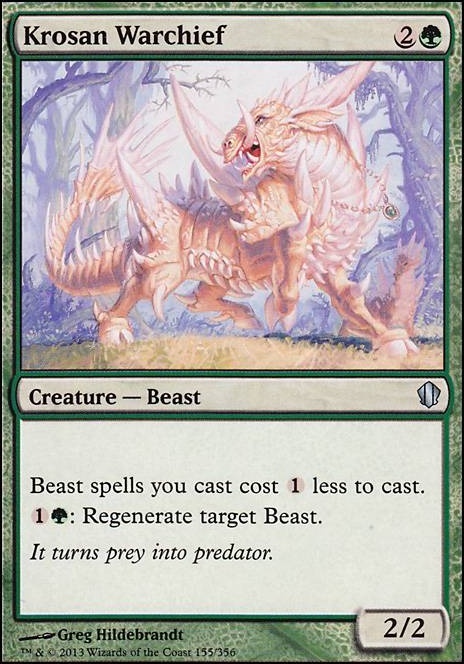 If you were thinking of building around Beasts, Leatherback Baloth, Kalonian Tusker, Krosan Warchief, and Rampaging Baloths would be a good place to start as all are relatively inexpensive.